the last two days I had to perform a really boring task. Lucky the "Copy and paste from history" feature made it a lot faster. 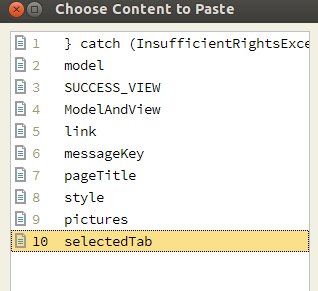 But I noticed that the "Paste from history" dialog is very laggy. When you press Ctrl+Shif+V the dialog popup immediatly - but if you hit the up or down key several times it gets laggy and does not update itself in time. Thats kinda annoying because often you hit up or down one to often because of that. This is actually the first time I really use that feature so I don't know if this lag is knew or or has been there for a while. A quick search showed nothing in youtrack or this forum. So am I the only one who has this lag? PS: I increased the number of elements in the history from 5 to 10 - but I had the lag also when it was just 5. EDIT: And I use the old default Skin - not the new Dracula Skin. Not sure if that makes a difference. The behavior you described is not normal and I don't observe it at local environment. Please record a cpu snapshot for a situation when everything is laggy when you press up/down and provide it for further analysis. Well, I still have some stupid copy and paste work to do. So when it becomes laggy again I will do the snapshot and upload it. Alright, I can reproduce the lag and it seems it has something to do with the content of the history. If I only have a single word for each history entry it works perfectly. If I have a entry with multiple lines it starts to lag. I attached two screenshot to illustrade what I mean. Each time the cursor comes to that item it lags. I will try to create and upload the CPU snapshot anyways. EDIT: I uploaded the CPU snapshot. The file is "IU-129.713_skerkewitz_19.06.2013_14.52.32.zip". I hope it is usefull, it's the first time I done it. But I hope you are able to recreate the behavior if you copy multiple lines into the history yourself now - should make it easier to find the issue. Thanks, Stefan, the problem is clear now - it occurs when paste entries are too wide for the current 'paste from history' dialog.